Fallow deer are one of the prettiest deer in Europe. Even mature Fallow deer look like young fawns, with dark chestnut coats covered in white spots. The bucks carry beautiful, impressive, flattened antlers. They are a popular park deer, and can be found in deer parks and preserves throughout the deciduous woodlands of Europe and Britain. reintroduced to northern and western Europe by the Romans, and brought to Britain by the Normans after their invasion in 1169. There are actually two subspecies of the Fallow deer, the European Fallow (Dama dama dama), and the Mesopotamian Fallow (Dama dama mesopotamica). 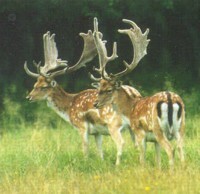 Mesopotamian Fallow deer are restricted to Iraq and Iran, and have almost been hunted to extinction. It is thought that the Fallow deer evolved from the Sika deer. Medium sized, thin, and rangy, Fallow deer are slightly larger than a domestic goat. They have long heads, with large eyes and ears, and a black nose. The bucks weigh about 55 to 70 kg, and can stand about 90 to 95 cm at the shoulders, while the females weigh about 40 to 45 kg, and stand 80 to 85 cm high at the shoulders. Fallow deer have several varieties of coat colors. Their coats can vary from black, white, brown, and yellow. The most common is deep chestnut, with white spots in the summer that darken to grey in the winter. The underbelly is white, and the rump patch is white with a black outline. A black line runs down the back and onto the upper surface of the tail. Fallow deer belong to their own genus, the Dama, because of their palmated, or flattened antlers. These antlers can reach a total length of 39 cm, depending on the age and condition of the buck. The tines of the antlers are club shaped. Around the base of the antlers a pearled crown, or coronet about 5 cm in diameter forms. Bucks will grow their antlers in late spring. A soft, blood-rich skin covering called velvet supplies blood to the growing antlers. Antlersl fully develop in about 12 to 17 weeks. By August, the velvet dries and is scraped off against bushes and trees. The fully developed and shiny antlers are used as a display to attract female and repel other bucks during the mating season. The antlers are shed in March or April. Fallow deer are herd deer. They don't have territories, but will have a home range over which they will travel, foraging for food. Ranges will overlap those of other herds. The make-up of the herd varies according to the season. For most of the year Fallow deer live in two different herds, adult females with fawns and yearlings, and bucks living alone, or in bachelor herds of three to five animals. The female herd is led by a dominant female. The two groups will come together during mating season. The rut, or mating season, occurs in October. The bucks will join the female herds, looking for a female in estrus, or ready to mate. When they find a ready female, they will keep other males from getting near her by locking horns and engaging in pushing matches. A buck reaches sexual maturity at 18 months, at which time they leave the female herd. They won't be ready to mate however for another 5 or 6 years, when the reach physical maturity, and can challenge other mature males for rights to a female. Does can breed at a year and a half. Pregnancy lasts 33 weeks with single fawns born in May and June. The newborn fawn weighs about 4.5 kg at birth. It doesn't follow its mothers around for about 2 weeks after its birth, but lies in hiding while she feeds nearby. Fawns will suckle until the next fawn is born. Fallow deer are mainly grazers, but will browse herbs, leaves, acorns, young deciduous shoots, and crops like sugar beets. Most of the water they need they get from what they eat. They were considered "Beasts of the Forest", and therefore belonged to the King. Permission from the King was needed by a nobleman to keep and hunt deer on his estate. Noblemen therefore enclosed their estates to control the deer, and be the only ones able to hunt them. Deer parks and preserves are the ideal habitat for the Fallow deer. They need the glades and open woodlands that parks have to offer. They use the forest's tree cover and undergrowth for shelter and winter food, and the meadows for feeding. Many Fallow deer have escaped the parks and live wild throughout the region. Today they are the most common deer species in the United Kingdom, with more Fallow deer in Ireland than their native Red deer. The European Fallow deer are not an endangered species. They are a protected game species throughout most of their range. They have been kept in game parks for hunting purposes almost from the time of the Romans. The Mesopotamian Fallow deer are considered endangered, and are on the CITES Appendix I. Some of the Fallow deer's predators in the wild are wolves, lynx and bear. Fawns are occasionally be taken by foxes.